Amid skyrocketing demand, Spokane's only needle exchange cuts back its services. Jeremy Gifford didn’t really care about staying sober anymore after a week in the Spokane County Jail. So he bought some heroin and shot up. And then he went and saw Lynn Everson. When Gifford got to the oddly shaped room in the oddly shaped Spokane Regional Health District building, there was a line of people, all carrying their used syringes in coffee cans, brown purses and paper bags. Everson sat behind a table, helping them count out their wares. Gifford gave her four used syringes and left with four clean ones. It was a small amount compared to what others carried. Still, it meant he had clean needles. And that’s not always the case. “I was hurting so bad, if I found a rig on the street, I would have picked it up and used it,” Gifford recalls of one occasion when he was out of town and didn’t have syringes. “Today is just busy,” says Everson, the district’s needle exchange coordinator, from behind a desk covered with needle containers, condoms and public-health pamphlets. For 20 years, the exchange has provided drug users with clean needles in exchange for their dirty ones in order to prevent the improper disposal of the used needles and to hinder the spread of HIV and other diseases. 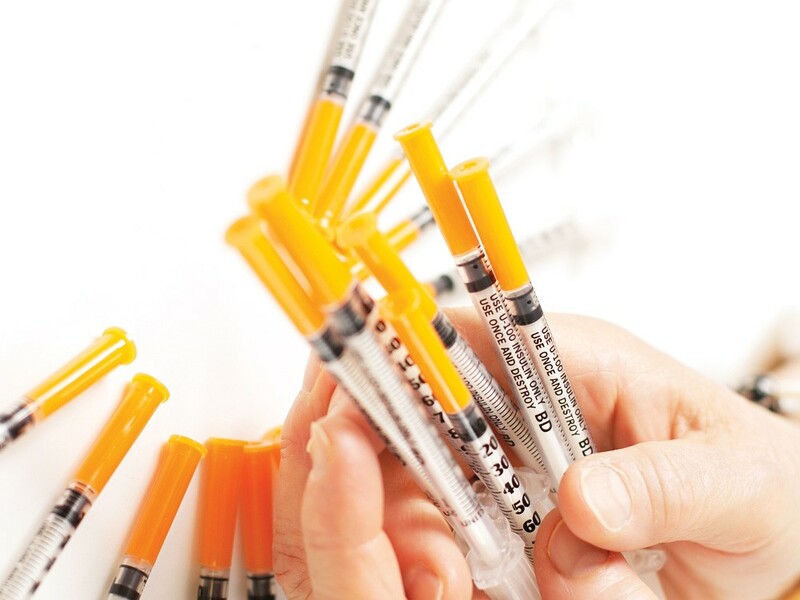 Demand for clean needles is booming. In 2008, 394,033 needles were exchanged. In 2010, it was 736,294. The Health District predicts it will exchange 1,071,000 by the end of this year. This is an all-time high for the service. And yet the money with which it operates is rapidly shrinking. Funding has dropped to the point that in early September, the exchange opted to impose a cap of 250 syringes per person per visit — an amount that Everson estimates is how much that a typical person uses in a month. Lisa St. John, the HIV and STD program manager for the Health District, which administers the exchange, says she’s not sure if the cap will save money, but it’s a first step towards reconciling a budget that she expects to shrink by 30 percent in this fiscal year. “This isn’t reflective of our service. This is a reflection in overall cuts in HIV prevention dollars,” St. John says. In fiscal year 2010, the needle exchange and HIV testing received $306,874. In the fiscal year 2011 budget, which has yet to be approved, St. John says she expects to receive $210,122. The district credits the exchange program with curbing the spread of HIV through injection drug users. It’s effective enough that social services in North Idaho, which has no needle exchange, direct their clients to Spokane and in some cases even drive them over the border themselves. The economy’s plunge in 2008 played no small part in the rise in exchanged needles, says Everson, who has worked at the exchange since it opened in 1991. But word-of-mouth has played a part, too. People come to the exchange from all sorts of backgrounds. Laid off from construction, dropped out of high school, working at a call center, attending Gonzaga University, subsisting on what they could scrounge up from a scrap yard. Many whom The Inlander interviewed last week said they were addicted to heroin, methamphetamine, or both. These addictions can kill, but drug deaths are actually down slightly in Spokane County, according to county Medical Examiner Sally Aiken. In 2010, 64 people died from illicit drug use in the county — down from 77 the year prior. Figures peaked in 2008, when 109 died. However, drug deaths are on the rise nationally (prescription-drug overdoses are increasingly the culprit, according to a recent Los Angeles Times analysis). In 2009, the Centers for Disease control reported that more people died from drug overdoses than traffic accidents. In 2010, the way Washington funded HIV prevention changed, says Maria Courogen, office director for infectious disease at the state Department of Health. The Legislature that year opted to switch from a system in which HIV prevention money is distributed to regional agencies called AIDSNET to a system where the money is distributed from the state to local agencies directly. The Department of Health has opted to distribute its money to where the disease is affecting the most people, which Courogen says is the Seattle area. Dave Purchase, director of the North American Syringe Exchange Network, worries that the realignment of funds may push the problem to other areas. “This is the first time I’ve ever had a fear I cannot shake that the genie we have kept in the bottle for 20 years in the Northwest might get out,” he says. That genie, he states, is HIV, and he fears it could become more prevalent as funding for needle exchanges and other social services is lessened. At Spokane’s exchange, the signs of the cuts are plain to see: sterile water, which Everson hands out in packets so that people don’t mix their drugs with tap water (which can contain minerals and other things Everson says are better kept out of your veins) is being limited. Everson used to give out containers to hold used needles. That ended, too; green Folgers coffee cans are the substitute. Talk, however, remains free, and that’s what Everson does with everyone who comes to her table. Bill came to the exchange with a brown paper bag full of 350 needles. He says he lost his truckdriving job, and so he lost his car and his boat and just about everything else he owned, but he kept his methamphetamine addiction, and his heroin addiction as well. The needles were for him and three others, although he usually brings somewhere around 1,250. He now predicts that he’ll be coming back more often, if he can make it. If he can’t, then his addictions dictate what happens next. “It’ll make you have to reuse,” says Bill, who spoke on the condition that his last name not be published. So far, Everson hasn’t seen an increase in the negative effects of needle use, such as sharing or reusing needles. She says it’s too early to tell.